"Raising Competent Children" is available in an Australian/New Zealand edition. A number of FamilyLab books will be available in Australia and New Zealand soon. If you would like to be notified when the books are available, please fill in the form at the end of this page. "Raising competent children" - AUSTRALIAN/NEW ZEALAND VERSION NOW - AU$ 14.95 - FREE POSTAGE! In this important book, Jesper Juul argues that today's families are at an exciting crossroads. The destructive values - obedience, physical and emotional violence, and conformity - that governed traditional hierarchical families are being transformed. Instead we can choose to embrace a new set of values based on the assumption that families must be built not on authoritarian force or democratic tricks but on dignity and reciprocity between parent and child. Children are competent to express their feelings from birth, and they are eager to cooperate. When our children's behaviour makes us feel less than valuable, then it is almost always because we are. That is, prior to a conflict, we were unable to convert our loving feelings into loving behaviour, our good intentions into fruitful interaction. Juul is a renowned international authority on the family. Using examples from families in many different countries, he has written a book that challenges parents to see their years with their children as an exciting time of growth and development for the whole family. Click here to watch: Interview with Jesper Juul about "Raising Competent Children". “Jesper Juul is one of the twelve leading enlighteners, thinkers and visionaries“. "We often think and act as if our relationship with children is a one-way street on which the traffic flows from us to them," notes Danish family therapist Juul, who champions a brave new family dynamic in this thoughtful multicultural and multinational analysis. From birth, he contends, children are "fully human - that is, they are social, responsive, and empathic," and over the past 30 years, in particular, they have become "less fearful and respectful of authority." Far from interpreting this trend as a breakdown in traditional values, however, Juul sees it as a healthy progression. Tracing the evolution of the family from the totalitarian power structure that has been in place for centuries toward what he calls the "post-democratic family," in which each individual is taken seriously and "the quality of decision making is accorded more importance than the decision itself," Juul sees humanity at a crossroads. He describes a new structure that is less about power struggles and violence ("an insult to any person's integrity - including children's") and more about dialogue and the responsible use of power, as well as about a core concept of "equal dignity." Although the book is more of a social analysis, Juul's helpful ideas and guidelines for parents make for an inspiring how-to manual for anyone interested in creating families "in which every individual can grow and prosper." Placed along with other parenting titles, this book will find an empathetic readership. (Nov.) Copyright 2000 Reed Business Information, Inc.
Jesper Juul provides parents with such an amazing, simple, and absolutely vital approach to raising children that it rings true on every page. Some of what he suggests we as parents do is difficult - as it is against our "knee-jerk" reactions we may have learned from our parents, but all of it is right on about how we can raise confident, healthy, whole humans, right from the start. I was thrilled to have discovered a book that allowed me to see different possibilities with child raising. Anyone with a child will gain immensely from reading this book, seeing themselves (as I did, over and over again) in his numerous examples, and learning how to move on from there. Without reservation, I am grateful for this book and highly recommend it. There are not enough superlatives to describe how helpful this book has been to our family. With tremendous wisdom and a warm, pragmatic eye, Mr. Juul helps us redefine the ways we look at a child's behavior and our relationship to our children and ultimately, each other. This is a book that doesn't offer easy answers or 'tricks' to help in the raising of your child. This is a book that helps you see with a child's eye, hear with a child's ear, and feel with a child's heart in ways that feel so natural and obvious, you will wonder why you haven't thought of them before. But trust me, you haven't. It is a book that offers day-to-day skills along with the thinking that helps generate them, leaving the reader feeling smart and well-satisfied. This groundbreaking book should be on the shelf of all parents everywhere. If you read only one book on raising your child, this is the one. This book takes a giant step forward in our knowledge of what children really need. It is based on a wealth of practical experience, but provides a profound theoretical basis for our interactions with children. And is easy to read... The book is well-written, and reveals Jesper Juul’s deep wisdom, love and understanding for both children and parents, as well as a good sense of humor and perspective. 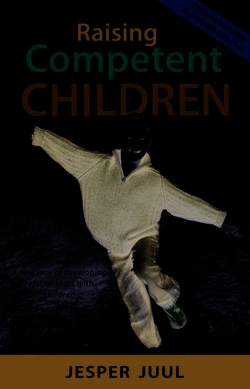 This DVD contains four lectures based on the concepts of the book “Raising competent children”. The background, history and science is thoroughly analysed. There is an in-depth section about the conflict between cooperation and integrity. The DVD also looks at the important issues of self-esteem and self-confidence, as well as social and personal responsibility. Finally there is a dialogue with an audience where a number of pertinent and highly relevant questions are answered. These are always relevant and often challenging. The four DVDs enable the viewer to “be” at Jesper Juul’s engaging seminars without leaving home. More than 6 hours. This is a voyeuristic book. You get a look into how other families live and how other parents and children relate to each other. With very clear, thoughtful, and sometimes, challenging feed-back by Jesper Juul. These families are just like yours and mine. The situations are exactly like those we all encounter. The 16 Coachings are a selection of the hundreds of families which Jesper Juul and Pernille W. Lauritsen from FamilyLab have met with. It really is a unique “sticky-beak” into the lives of other families. Every article is based on a letter written to FamilyLab, a brief pre-coaching interview, a 1-2 hour coaching session as well as a follow-up interview. Nothing is made up or changed except for the names, which have been changed for privacy reasons. Just about all of the families who met Jesper have been able to breath a sigh of relief, as it were, and say to themselves: “I am so relieved that what I felt inside was actually right.” Something very special runs through all of these stories. By and large children just want to grow up in a secure environment and learn to become independent individuals. As parents and carers we can only enable our children to do this when we slowly and genuinely pass responsibility on to them, show them we trust them and allow them to make mistakes. This book gives you a unique insight into how strengthen the rapport between the members of your family. In this book Jesper Juul and Monica Øien take a journey through the different rooms of a house. In the first chapter we enter "A home full of emotions" and work out what turns a house into a home. Once inside we visit different rooms: the bedroom, the nursery, the kid's room, the teenager's room, the bath room, the kitchen and the living room. In each room a variety of typical situations are analysed - things that most families experience - how to deal with a 2 year old who wants to wear summer clothes in winter, what to say to a 15 year old who has had alcohol, and hundreds of the other challenges in between. Sleep, play, food, friends, hygiene, independence, community, are just some examples of what happens inside every home. The book is full of practical and down-to-earth suggestions all focussed on respecting the dignity of both child and parent. In a conversational style Jesper and Monica philosophise about how to develop the best relationships with our children, how to raise our children to be safe and independent, and who really ought to set the agenda - if we add a little trust, is it possible that our children are very capable of handling a number of situations? These are conversations from the heart - based on more than 30 years of experience with family therapy. This book is full of inspiring and often challenging suggestions based not on what we do, but on how and why we do it. "The Art of saying: No!"